Tim Read, the National President of the Pioneers Society said, I’m shocked and saddened by Bruce’s sudden and very untimely death and I know that’s how all my colleagues on the National Executive Committee and other members will feel. We send heartfelt condolences to his family. Bruce was the Society’s devoted, hard working and ever friendly National Secretary-Treasurer for 25 years and for all those who came into contact with him, he was, in every sense, the Society itself. With a membership growing in six States branches to 2,500 and with no physical offices to relate to, Bruce was the one constant, providing the Society and its members with loyal, very efficient service. Bruce Leonard (left) receiving the National Pioneer of the Year award from Mike Selwyn. 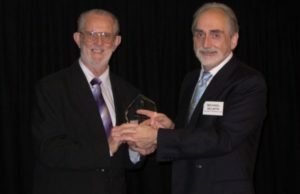 In 2014, the Society gave Bruce its highest honour making him the National Pioneer of Year and he is seen here in this photo receiving it from Mike Selwyn, the National President.